Even though the weather where I live is hot today, it is still the first day of fall, my favorite season! I am celebrating with this Hello Fall Pumpkin Spice Latte card! The card is made using a crumb cake card base, top folding. I added the pumpkin pie layer that I embossed with a fall leaves embossing folder from Darice. The coffee cup and greeting are from the new Merry Cafe stamp set by Stampin' Up! 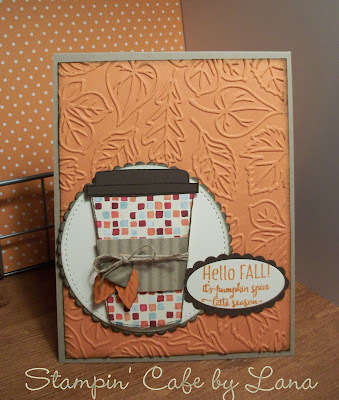 The patterned paper for the cup is from the new Painted Autumn DSP by Stampin' Up. I hand cut a band from a piece of crumb cake cardstock that I ran through my crinkling tool, tied some linen thread around the cup, and added some stamped and cut out orange leaves and a small crinkle cut heart. The circles and ovals are from dies and punches. Enjoy Pumpkin Spice Latte Season! I know I will! Note: All colors used for this card are from Stampin' Up - Crumb Cake, Pumpkin Pie, Early Espresso and Very Vanilla. my niece, arlana is truly amazing! love allll her artistic cards, and articles!